As we age our muscles deteriorate. It’s just a fact of life. Unless we exercise, keep fit, and eat a balanced diet, we can lose almost all our muscle. The same applies to our brains. We must continue to challenge and sharpen our brains as we get older. Those involved in elder care in Toronto are wise to facilitate certain activities for seniors to help sharpen their thinking, memory and reasoning skills. 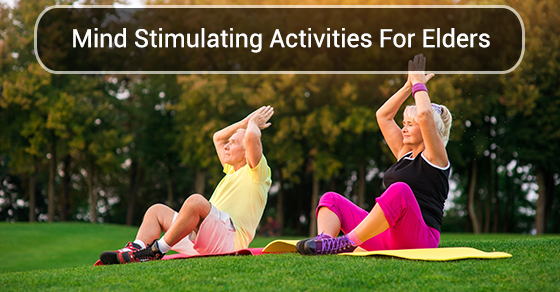 We have gathered 5 mind-stimulating activities for elders you can incorporate into their lives. Simple activities can be altered to challenge a senior. Have them close their eyes while buttoning their shirt or tying their shoes. If they still drive, one day ask them to take a different route home with you in the car. Ask them to do something like brushing their teeth with their other hand. These all seem like simple tasks but these activities can be mentally challenging for an elder in Toronto. Talking to a friend or relative on a regular basis is a great activity to exercise cognitive skills. It helps keep a senior engaged in life and socially active. Remember the days when families played board games at night? It was helpful for young and old. It still is. Crossword puzzles helps them to problem solve and encourage memory. Playing Scrabble challenges cognitive abilities and reasoning. Computer games are readily available. Seniors can choose those of interest. They just need to be introduced to them. Bingo is another game which not only involves concentration, but it also helps with socialization. Try A New Hobby Or Pastime. Who says you can’t teach an old dog new tricks? If you are tasked with elder care in Toronto, encourage your senior to try something new. Knitting can be relaxing, as well as helping to strengthen fine motor skills. Drawing simple pictures of the outside world or of a person can be a fun and rewarding activity. Painting is another way to challenge an elder to improve concentration, even the “old paint by numbers” sets can be a mental challenge and stimulate their mind. Yes, we mean cursive writing. Writing with a pen and paper is becoming almost obsolete but it can be a positive mental and physical challenge for a senior. Even if they find it difficult and the handwriting is not perfect, encourage them to continue. Suggest they send birthday cards to friends, grandchildren and other relatives with a handwritten note inside. Have them address the envelope including their return address. Challenge them to write down the names of all their relatives, or create a family tree. Even if your loved one is not showing any obvious signs of cognitive issues, choosing certain activities can help keep their mind alert as well as reduce the risk of age related dementia. Contact C-Care Health Services for assistance with elder care in Toronto. We are here to help with all home care needs.